The tall coreopsis is large, spindly perennial with bright, cheerful yellow flowers. 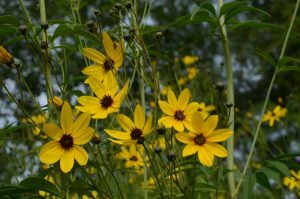 The long bloomer sports ample amounts of daisy-like flowers from July into September. An extremely successful self-seeding perennial that can become aggressive so it is often best used in naturalized settings. Can tolerate rocky, dry soil.